You might notice from the title of today’s episode that I have a thing for alliteration. That’s a copywriting technique, which is not what we’re talking about today. I say that because I see people confuse the two terms all the time. Just a couple of weeks ago on Facebook, someone asked for copywriting advice, and was met with an earnest explanation on copyright law. It happens. Worse, a lot of unemployable types have good questions about copyright, and unfortunately are met with laughably bad advice based on a misunderstanding or downright ignorance of copyright law. Pro tip: Maybe don’t look to your Facebook friends for legal advice? Just saying. I know it’s not the most exciting topic in the world, but it’s important to understand how copyright works, and how easy it is to infringe. I promise to make it quick and interesting. Well, at least quick. Let’s do this! What’s Legal: When Are Background Sounds With A Copyright In Video Clips OK? Voiceover: Welcome to Unemployable, the show for people who can get a job, they’re just not inclined to take one, and that’s putting it gently. In addition to this podcast, thousands of freelancers and entrepreneurs get actionable advice and other valuable resources from the weekly Unemployable email newsletter. Join us by registering for our free Profit Pillars course, or choose to sign up for the newsletter only at no charge. Simply head over to Unemployable.com and take your business and lifestyle to the next level. That’s Unemployable.com. 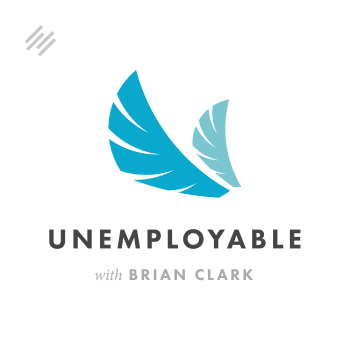 Brian Clark: Hey there, welcome to Unemployable. I’m Brian Clark, founder and CEO of Rainmaker Digital. This is the podcast for freelancers, consultants, coaches, and entrepreneurs looking to take things to the next level. Today’s episode is called “A Crash Course in Copyright for Creators.” You might notice from that title that I have a thing for alliteration. That’s a copywriting technique, which is not what we’re talking about today. I say that because I see people confuse the two terms all the time. Just a couple of weeks ago on Facebook, someone asked for copywriting advice and was met with this earnest explanation of copyright law. It happens. Worse, a lot of unemployable-types have great questions about copyright and unfortunately are met with laughably bad advice based on misunderstandings and downright ignorance of copyright law. Pro tip: maybe don’t look to your Facebook friends for legal advice? Just saying. Speaking of legal advice, I used to be an attorney but I’m not anymore. Even if I were, this would not constitute legal advice. I am reasonably sure, and have gone and checked myself to make sure I’m giving you good information, but it’s no substitute for talking to your own attorney as needed. Another thing I’d like to ask real quick — if you find this episode useful, if you find this show useful, would you do me a favor and head over to iTunes and leave a review? You can get over there easily by going to to Unemployable.com/iTunes. It helps the show. I really appreciate it. Thank you so much. All right, let’s start with the basics. What is a copyright? Copyright is a form of legal protection provided to the creators of original works of authorship. That doesn’t just mean “written” when they use that term, “authorship.” It applies to literary, dramatic, musical, artistic, and certain other intellectual works — both published and unpublished. We’re talking about things like books, articles — those are copyrighted. Music. We’ve heard about copyright in that context since the beginning of the Internet. Also paintings, drawings, and illustrations. Website design. Logo design. These are all protected by copyright. Let’s clarify some of this though, because copyright protects the form of expression rather than the subject matter itself. For example, a description of a machine in writing would be copyrighted, but this would only prevent others from copying that written description, it would not prevent others from writing a description of their own or from making and using the machine based on your description. If you wanted to legally protect the engineering processes that create the machine, that is a subject of patent law, not copyright. Also, individual words and short phrases are not covered by copyright. Copyblogger, StudioPress — these are trademarks, these are brands, they cannot be copyrighted. Interestingly though, for example, the StudioPress logo outside of the trade use does have copyright attached to it for the visual elements of it. Finally, I want to stress that ideas are not protected, only the expression of the ideas. For example, let’s say I come up with this great new online marketing technique that’s worked for me. I give it a clever name and then I write an article about it and spread it out to the world. Someone out there can take that technique, that idea and make it their own. Write their own article and not give me any credit whatsoever. It’s still not a violation of copyright, because it doesn’t apply to ideas. Now, would the ethical thing to do be to give me credit? Yes. Can you get in trouble with your audience if they notice you’re taking other people’s ideas blatantly? Yes. Remember, what’s legal and what’s right are not always the same thing. Next up, let’s talk about how a copyright is created. In the United States, copyright protection automatically extends to any covered material as soon as it is expressed in tangible form, which means as soon as it’s created. For example, I write articles in Google Docs and I transfer the copy over to the post editor and format it in HTML. Both versions are copyrighted, even the unpublished initial draft that no one ever sees but me. Now, you may have heard about copyright registration and think that’s how copyright is created — that’s not true. Again, copyright exists from the moment of creation. Copyright registration increases the legal protection for your work and the likely value of any award you might recover in an infringement suit. Registration gives you easier and greater right to pursue an infringement claim and you get better damages out of it because you went through the registration process. What does that mean in practical terms? Should you register every article you write for content marketing purposes? No, at least I wouldn’t. Should you register your self-published ebook that you sell? Yes, that is a substantial work, you charge money for it, and it’s part of your business. That would be worth registering. Speaking of infringement, what constitutes copyright infringement? It’s easier to do than you think, and you probably do it all the time without knowing. It used to be hard to make a copy. You have a physical book and you want to make a copy of it, that’s a big job. In the digital world with sharing and mashup Internet culture, you likely commit copyright infringement all the time without even knowing. By the way, not knowing is not a defense. Essentially, copyright infringement happens when you make a copy without the legal right to do so. Very aptly named, right? Let’s do an easy example. Again, I write an article. I put it out there. You copy and paste it or scrape my RSS feed and post it on your own site. Copyright infringement. Here’s an example that may not be so obvious though. Let’s say a friend of yours posts a great photograph that they took on Instagram. You think it’s awesome and you want to share it elsewhere, so you download it to your hard drive and then you upload it to Facebook or Twitter. You’ve committed copyright infringement. Get this, just downloading it to your desktop was infringement because you made an illegal copy. Publishing it isn’t the criteria, but publishing it is how you could get caught. They’re both instances of making a copy without the right to do so. Here’s another story that will give you pause about when you can be guilty of copyright infringement. In our case, running Copyblogger, throughout the years we have often been media sponsors for various industry conferences. Usually we’re friends with the people who run those conferences. We promote the conference on the blog and then at the conference we get listed as a media sponsor. One time this happened. We agreed to promote a conference and we were given banner ads and graphics to promote the event. We did use them in a post and then years later we get a cease and desist and a demand for money based on the fact that the banner that we published on the blog contained an image from a photographer and there was no right granted by that photographer for their image to be used. We look into it with our friends and turns out that yes, a designer they had used went and took a picture off of the Internet — probably Google images — and used it to create the banner. That’s copyright infringement. Not just for them, for us. It doesn’t matter that we didn’t know. It doesn’t matter that we didn’t create the banner. We made a copy we didn’t have a right to. That’s tough. In this case, luckily, our friends took care of us. They settled with the photographer on behalf of both of us. What if they hadn’t been cool about it though? We would have had some remedies, but they would have been difficult because it was a handshake deal with people that are friends in the industry. We didn’t have any sort of contract. If we would have had a contract there would have been an indemnity clause, which means if you do something bad that causes us damage then you will compensate us. Even then, we would have still been guilty of infringement. We would have had to settle with the photographer and then after that go to our friends based on the indemnity provision in the contract. That’s something to take to heart when we do handshake-type deals like this. There is criteria here about how substantial the use was. The duration, how well it’s heard — all of these things. But she’s asking because people are doing videos with background music to enhance the video all the time. Somehow they think that’s different from mixing in that track in Garage Band, because that would be infringement, but it’s just in the background. Nope, that’s a copy of a copyrighted work. Again, there are some criteria, but if you’ve let a whole song play on purpose because it enhances your video that you’re doing for commercial reasons, you could get in trouble for that. That brings up the topic of fair use, because that’s probably what’s running through some of your minds right now. “Wait a minute, isn’t there this concept of fair use where I’m allowed to use other people’s copyrighted stuff?” Yes there is, but let’s talk about what fair use is not. Fair use is not copying my article and then providing a link back to the article. That does not mean anything, you have still committed copyright infringement. Providing attribution — for example, you take that Instagram picture and you attribute it back to the original source — is meaningless, it doesn’t matter. Copyright infringement. This is my favorite one, because it happens all the time on YouTube. Someone will post some copyright material and they will say, “This is not my content and I have no ownership of it, blah blah blah.” Yeah, we know that, you committed copyright infringement, it doesn’t matter. What fair use is, is when you copy copyrighted material done for a very limited and transformative purpose such as commentary, review, critique, parody. These uses can be done without permission from the copyright owner. But let me make this clear, millions and millions of dollars have been spent litigating what fair use is and no one’s still entirely sure. Here’s the thing to keep in mind as a business owner, the purpose and character of the use — including whether it’s commercial or nonprofit — matters. You can guess which side is going to hurt. If you’re doing it for commercial purposes, fair use is very restricted. Don’t rely on fair use to get you by, because it’s very complicated and you may get in trouble. Back to the background music example, these people are intentionally playing music to enhance their video which they’re using for marketing or promotional purposes. If someone were so inclined to do so, they would probably be busted for infringement. Okay, how does someone legally gain copyright from someone else? If copyright is fixed in the creator, doesn’t that cause problems for people who hire people to create stuff? Number one, employees are deemed to be creating in the act of their employment for the benefit of their employer. The employer would hold the copyright in those instances. You don’t have to worry about that from people that are on your staff doing design, writing, coding, etc. If you’re working with freelance people who are not your employees, then you have to have a written agreement which includes a “work-for-hire” provision. The work-for-hire provision is the way a creator gives over their copyright in that context to the person who hired them to do it. Let me tell you a true story here. I’ve got a friend who is a doctor. She had a website created years ago and the website was fine for years. She got in a dispute with the designers that did it for her over the hosting service that they were using. Effectively, they were getting paid to host the site as well. They held the site hostage because they never had a written agreement, which means they owned the website and they weren’t shy about asserting that claim. That’s slimy, right? Even though it’s legally correct and there are other theories where she could have gone after them for that. Eventually they gave up and let her go. Without a work-for-hire agreement with your designer or a freelance writer or a freelance coder, they own their work. Make sure that you get that agreement. Now, if you’re on the other side of that and you are the writer, the designer, or the freelance coder, you should be a good service provider and make sure that you have work-for-hire provisions in your contract if you’re using yours instead of theirs. If they balk at signing a contract, you just say, “Look, I need to get paid, I need to spell out the terms here. But without this provision you don’t own what you’re paying for.” That usually gets people to fall in line pretty quickly. The other way that you can use someone else’s copyright is through licensing. For example, in my earlier example of taking a picture from Instagram and posting it elsewhere, let’s say that that same photo was tweeted on Twitter and you Retweet it. You made a copy. Are you guilty? No. The Twitter terms of service require people who post things there to submit to a non-exclusive license so that if you’re using the features of the platform then it’s not deemed to be infringement. In other words, you’re operating pursuant to that license. If you take that photo from the Tweet, download it to your hard drive and then Tweet it as an original Tweet, it’s copyright infringement twice, as we’ve already talked about. Seems strange, but that’s how it works. Another form of license is Creative Commons. A lot of people post their photographs — used to be on Flickr. Some writing is licensed under Creative Commons. Usually, not always, you can’t use it for commercial use. And if you do, you’ve violated the terms of the license and therefore you’ve committed copyright infringement. Be very careful about that. In a more sophisticated licensing arrangement, say someone has created a bunch of video content and I want to display it on my site, you could have a license agreement that you negotiate. What’s interesting there is if you violate one of the terms of the contract, you’re guilty of breach of contract not copyright infringement … yet. The terms of that license agreement will dictate what happens there. That’s important, because copyright damages can be extensive. They’re that way to discourage people from blatantly violating the copyright of others. Finally, copyright can be transferred by assignment. For example, if I want to buy the rights to a book, I would have to get a valid assignment of the copyright in exchange for money. You buy a website, its design, and all its content — same thing. Any time you are requiring this type of asset, make sure that you get a valid assignment of all intellectual property rights, including copyright. Finally, let’s get down to the real world and the answer that kept coming up on Facebook, which is, “Everyone does it.” That has nothing to do with the law, I’m sorry. In the real world it does happen all the time, and most people don’t get sued for copyright infringement for some of these technical examples of violating someone’s copyright. But that’s not a good reason to go ahead and keep doing it. It’s like grammar, you got to know the rules before you break them. In this context, you need to understand when you’re infringing on copyright so you can assess the actual risk of going ahead and doing it anyway. Of course, the best rule of thumb would be to avoid infringement at all times, but let me give you a counterintuitive example here. Who would you feel safer infringing upon with a photograph, Disney or a small photographer who also lives in the United States like you do? Who’s more dangerous to you? The small photographer. In fact, there are attorneys out there who specialize in nothing but representing photographers whose work gets taken online because there is software that can find all the instances of that photograph online pretty easily. Then it’s just a matter of sending out letters and wrangling settlements out of people. Disney, on the other hand, probably doesn’t know and doesn’t care. It’s not worth it to them to get a five grand settlement out of you. That doesn’t matter. They’re probably going to get bad PR if they hassle a little guy. You get my gist. Please, don’t act on that, don’t infringe anyone. I’m saying that’s counterintuitive about the motivations of different levels of players within the world of intellectual property. All right, I hope this has helped. I hope it wasn’t too terribly boring. At least it wasn’t that long, right? Go forth and do not infringe or let others infringe on you, and keep going.